As you are aware, the children of NJS have been unable to do their swimming lessons for the past few months. This is because of the work currently happening which started on the 7 January. All the contractors and workers have worked really hard and are doing an amazing job. 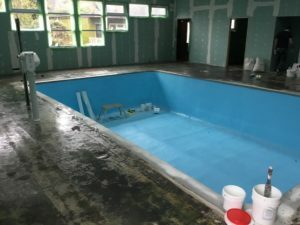 This new, amazing swimming pool is getting even better every day – it is going to be fabulous! 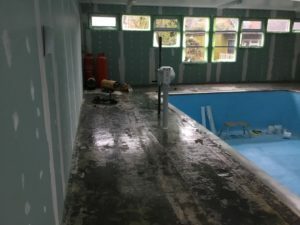 We (School Council) were able to visit the pool recently to see the changes that have been made. The contractors are redoing practically everything! We have new windows, doors, floors and walls. We have learnt that the floor sealer used takes one week to go off. On top of this will go a grey flooring which will have resin on top to make it smooth for bare feet. The new windows are triple glazed to keep the warmth in, the walls have already been plaster boarded and plastered. When they are painted the new colour scheme will be white and pale grey. Another of the changes that we talked about is the door being made wider so a wheelchair can fit through. The pool itself will be the same size as before. Non swimmers please don’t worry about the depth because it will be the same! It has had a new blue lining to help keep it protected. The pool will also have all new filters so it is really important we all wear our swimming caps to make sure the filters are looked after. Before, there were lots of problems with the pool. It didn’t work properly and the surroundings weren’t always nice. But that is now a thing of the past! Our new pool is going to be amazing. It will be something to be proud of. School Council are also taking responsibility to help Steph keep it clean and new. We are all very excited about when the pool opens in March and can’t wait to get swimming! This entry was posted in School News, Email Bulletin - All by chloe watson.